This pair of gaiter keep your leg/ankle warmer, dry and keep the debris, leaves, rocks, snow, mud, water out of your shoes/socks, especially work great for a trial run. Multi-purpose protection, protect your running footwear from trail debris and keep it from entering your footbed. A must have in your backpack when go for hiking. 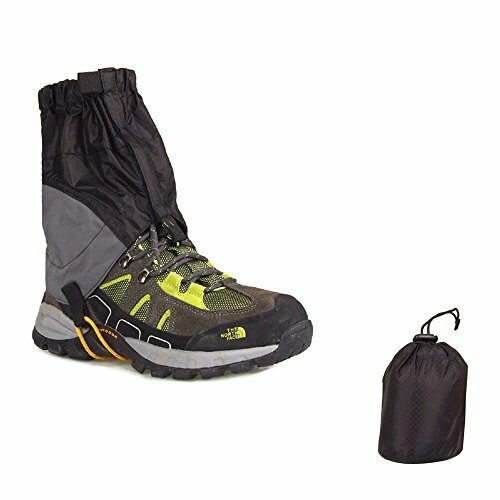 Only 1 pair gaiters included, the shoes showed in picture is not included. 1.Material: Silicon coated nylon checkered cloth. 2.Snow Leg Gaiter, Lightweight, Portable, Smaller, Shorter Design. 3.There is webbing cord in the bottom of this gaiter, can be set on the hiking shoes and use with waterproof pants. 4.With adjustable elastic band and snap fastener for convenient and firm bundling. Velcro and zip for easier putting on and taking off. 5.Durable and reusable, keep away from mud, trail debris, and hungry insects. Ideal for hiking, climbing, skiing, exploring or other outdoor activities. If you have any questions about this product by UHNT, contact us by completing and submitting the form below. If you are looking for a specif part number, please include it with your message.